A Soyuz rocket streaked into the night skies over the Baikonur Cosmodrome on Thursday, carrying the Progress MS-02 spacecraft into orbit for a cargo-delivery mission to the International Space Station set for arrival on Saturday with over 2,400 Kilograms of supplies for the six crew members in orbit. Thursday’s launch caps a busy month for the Russian Soyuz booster. The workhorse launched four missions in March – a single launch from Plesetsk with the Bars-M mapping satellite and three missions from Baikonur, lifting the Resurs-P No.3 satellite to orbit, launching three crew members to ISS and sending into orbit the next batch of cargo for the Station. 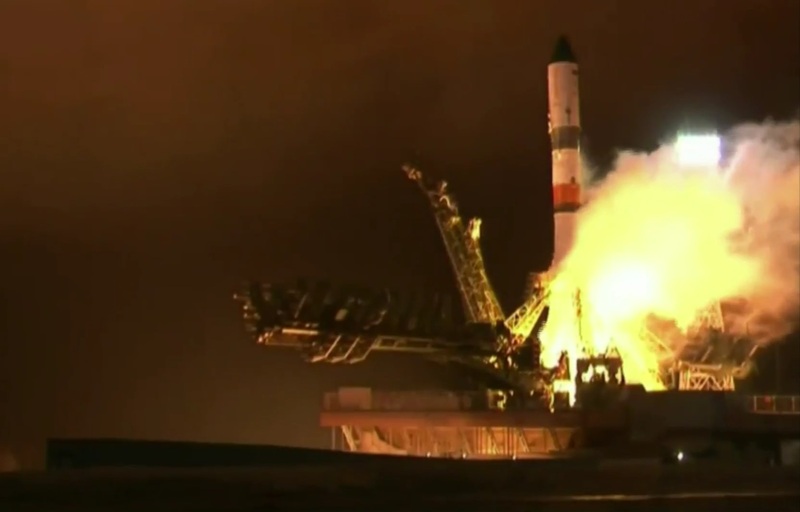 Soyuz 2-1A lifted off from Site 31/6 at 16:23 UTC on Thursday, blazing into the dark and cloudy skies over Kazakhstan on the standard ascent path towards the north-east, flying to the Russian border. 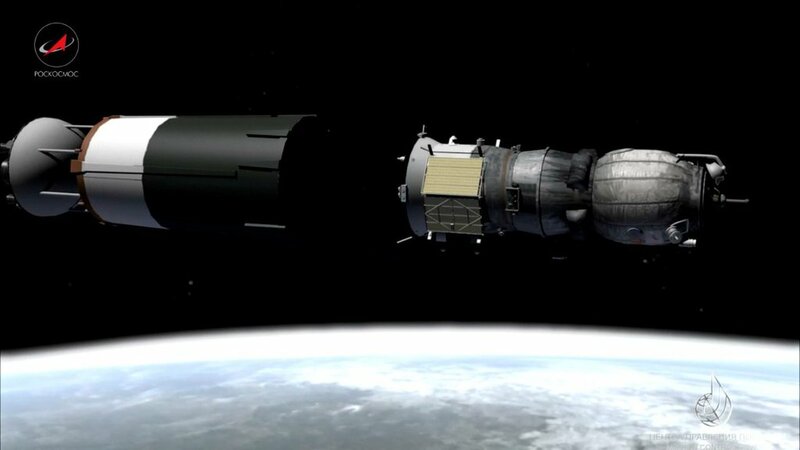 The four boosters of the Soyuz did most of the work for the first two minutes of the mission until separating from the vehicle. Soyuz relied on its core stage until the third stage took over four minutes and 47 seconds into the flight followed moments later by the separation of the launch shroud, revealing Progress on its way to orbit. Soyuz concluded another textbook mission at T+8 minutes and 48 seconds when the Progress MS-02 spacecraft was sent on its way, starting out in a 200-Kilometer orbit. Because this is only the second flight of the Progress MS upgrade, the the mission sticks to the two-day rendezvous profile for testing of the new MS systems along the way. Raising its orbit, Progress is expected to make an automated docking to the aft end of the Space Station at 18:00 UTC on Saturday. The MS upgrade of the Progress cargo and Soyuz crew fleet marks the inauguration of the latest and likely last round of major upgrades on the spacecraft. Over the course of over four decades of Soyuz and Progress operations, the spacecraft went through a number of generations with incremental upgrades to keep the vehicles up to date with current technology. The MS upgrade focuses on communications and navigation systems, inaugurating a new Unified Command & Telemetry System replacing the Ukrainian-built Kvant-V radio. GPS and Glonass receivers allow Soyuz and Progress to complete on-board orbit determination and the new KURS-NA radio navigation system reduces the number of antennas on the spacecraft. A Phased Array Antenna installed on the spacecraft allows Progress MS to communicate with Luch 5 data relay satellites in Geostationary Orbit for a continuous link to Mission Control. Also, relative navigation with ISS will be possible through the exchange of GPS/Glonass data, adding flexibility and redundancy to the missions. Other changes on the spacecraft include the addition of external debris shields, the implementation of a backup drive mechanism in the docking mechanism and the inauguration of external compartments that can be used to release small CubeSats into orbit. In keeping an overall commonality between the crewed Soyuz spacecraft and the uncrewed Progress cargo craft, the Russian space program has the unique capability of introducing new systems on the Progress spacecraft first, going through extensive evaluation on the uncrewed craft before being implemented on the Soyuz. 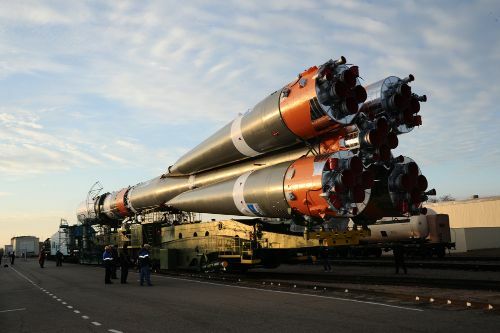 Soyuz 2-1A and Progress MS-02 went through an uneventful countdown, picking up eight hours prior to liftoff with the activation of launcher and spacecraft leading into a detailed set of checkouts and reconfigurations. At the pad, teams spent the first hours of the countdown installing batteries on the Soyuz, removing protective covers and preparing for propellant loading. 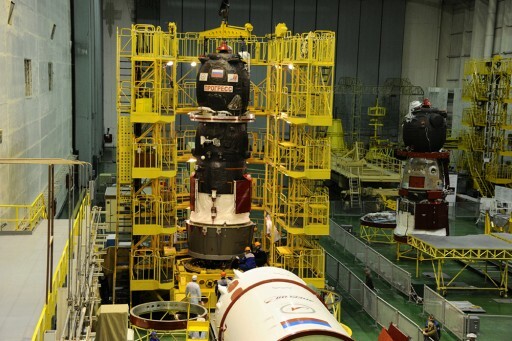 The Russian State Commission provided the all-clear for tanking after running through a final review of launch vehicle testing and the status of the countdown. Soyuz entered tanking at L-4 hours, the start of a two-hour operation to fill the four boosters, the core stage and the Block I third stage with 274 metric tons of rocket-grade Kerosene and -183°C Liquid Oxygen. The boosters and core also received Liquid Nitrogen to be heated up in flight in order to keep the tanks at pressure. 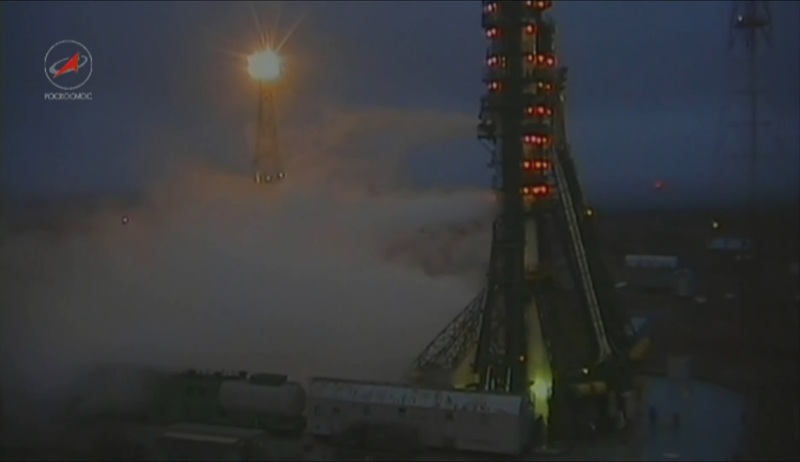 While tanking was in in progress, the sun set on the Soyuz rocket setting the stage for a nighttime liftoff at 10:23p.m. local. 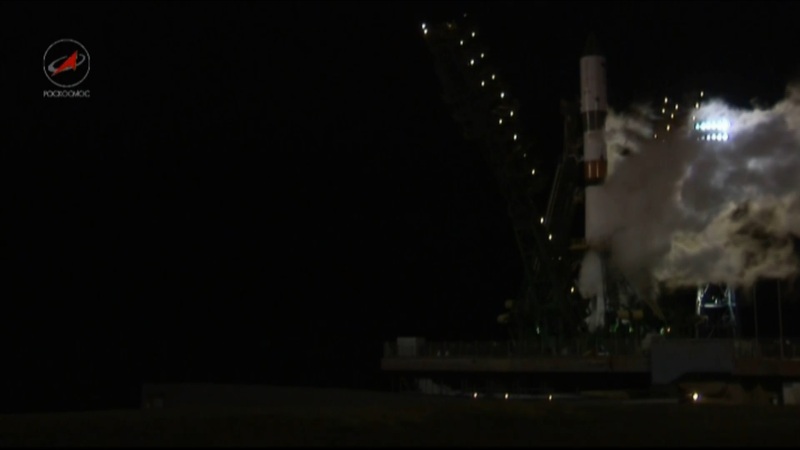 Propellant loading was by the book and Soyuz entered a last round of checks while teams closed out the rocket and Service Structure. 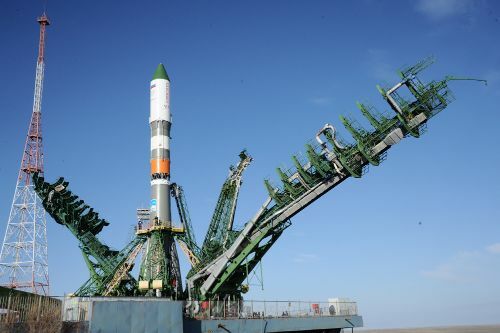 Guidance System configuration was completed inside L-1 hour and the two halves of the Service Structure were lowered at L-35 minutes, revealing the 46-meter tall Soyuz atop its launch pad. Launch Command Power was applied and all pad structures were safed by switching off power supplies. With less than half an hour to go, all personnel departed the pad, reporting to Station inside the Launch Bunker or at a safe distance. Heading into the last six minutes, Soyuz began executing a highly choreographed sequence to transition to its autonomous launch configuration. 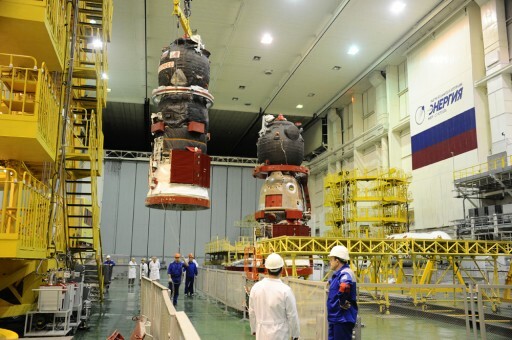 Soyuz purged its booster and core stage engines with nitrogen to remove any combustible substances and ensure a controlled ignition, next was the pressurization of propellant tanks followed by the handover of control to the Soyuz that also switched to internal power at the T-1-minute mark. Ignition Sequence Start was commanded at T-20 seconds and igniters were fired as turbopumps spun to flight speed and propellants were injected into the engines to initiate the combustion process. The RD-108A engine on the core and the RD-107As on the boosters reached an intermediate thrust level before ramping up to full thrust to lift the 308-metric-ton Soyuz off its launch pad. 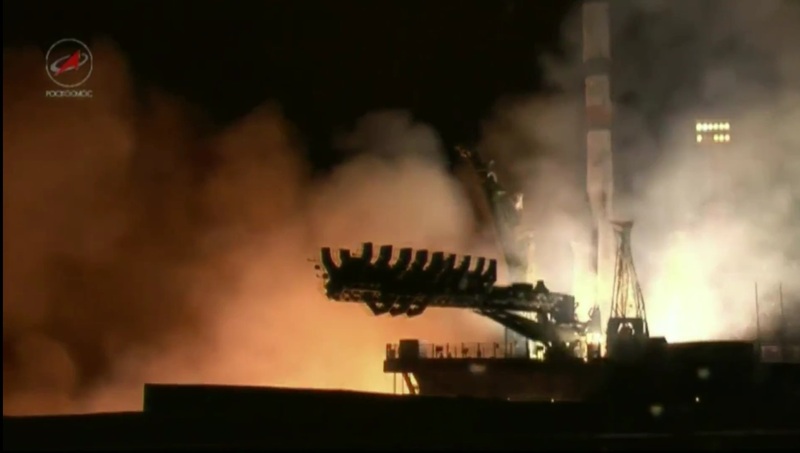 Soyuz started rising from its pad at precisely 16:23:57 UTC under the loud rumble of its engines, balancing in a vertical posture for a little over ten seconds before starting its pitch and roll maneuver. 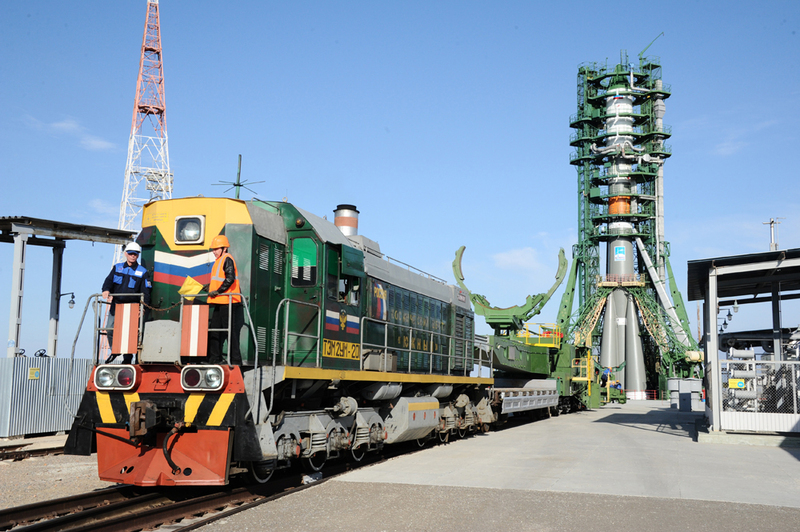 Putting its improved guidance system to use, the Soyuz rolled onto a standard departure path out of Baikonur, flying to the north-east with a total thrust of 422 metric-ton-force. Burning 1,600 Kilograms of propellants each second of powered flight, the Soyuz showed rock solid performance when pushing through Mach 1 and encountered Maximum Dynamic Pressure as it passed the 1-minute mark. 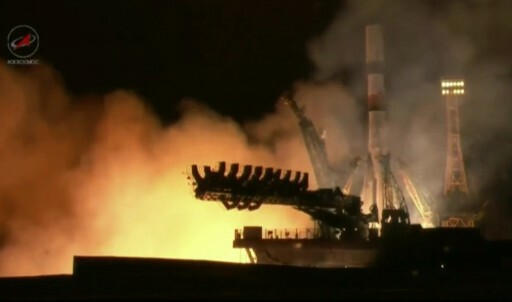 The Launch Bunker’s running commentary of the flight indicated good performance of the Soyuz rocket with good stabilization and engine pressures throughout first stage flight. The four liquid-fueled boosters operated for one minute and 58 seconds, each consuming over 39 metric tons of propellants to help accelerate the vehicle to over 1.5 Kilometers per second. Separated by pyrotechnics and and pushed outward, the four 19.6-meter long boosters made a clean separation as they swung out and away from the core. With the boosters falling back to Earth for a crash landing 355 Kilometers from the launch site, Soyuz relied on its four-chamber RD-108A engine to continue the climb into orbit. Assisted by four gimbaling verniers for vehicle control, the core delivered 102 metric-ton force of thrust when flying through the upper layers of the atmosphere. This flight was sticking to the modified Progress ascent profile developed for Soyuz 2-1A to keep the usual drop zones for the Core Stage and other debris. Because Soyuz 2-1A is more powerful than its Soyuz U/FG predecessors, its stages would travel further downrange, requiring its performance to be intentionally decreased to keep the old zones and avoid potential political conflicts. 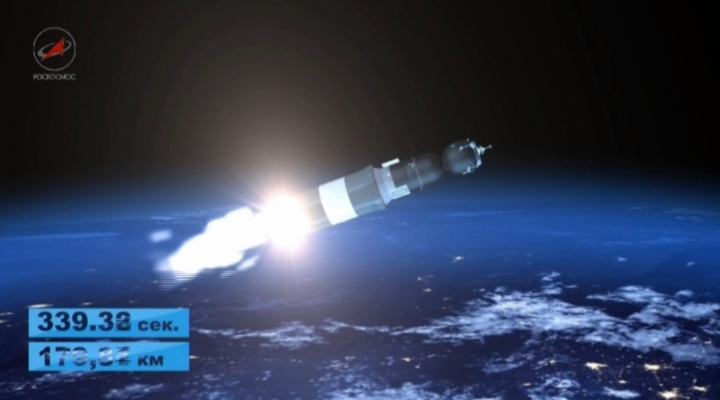 Therefore, Soyuz holds the launch shroud throughout the burn of the core stage to carry some additional weight and allow the core to separate at conditions similar to Progress launches on Soyuz U. The RD-108A engine of the Core Stage concluded its burn at T+4 minutes and 46 seconds to kick off the hot-staging sequence. Under two seconds after cutoff, the RD-0110 engine of the Block I upper stage was ignited in unison with the firing of separation pyros to allow the third stage to pull away from the empty core, having consumed 91 metric tons of propellants. The spent core stage coasted uphill for some time before falling back to Earth, re-entering the atmosphere and impacting around 1,550 Kilometers from the launch site. Ten seconds after third stage ignition, the protective payload shroud was separated followed split seconds later by the jettisoning of the third stage aft section covers to fully expose the engine section. 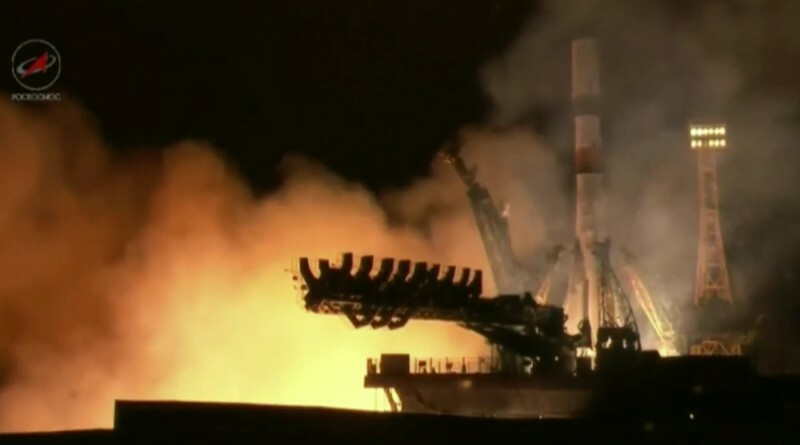 Revealed for the rest of its trip into space, Progress MS-02 continued to receive a smooth ride into orbit, as evident by calls made in real time, reporting a normal performance of the third stage and its 30,400 Kilogram-force engine. Sporting four chambers and a four-chamber steering engine, the Block I stage fired for four minutes, finishing the job of lifting the 7,290-Kilogram Progress spacecraft into Low Earth Orbit. Progress MS-02 was aiming for an insertion orbit of 193 by 240 Kilometers, inclined 51.67° with an on-target insertion expected from the Soyuz 2-1A and its modern guidance system. Using the two-day launch-to-docking profile, Progress was launched into an orbit at a 361-degree phase angle to that of ISS instead of the small phase angles of around 30° required for the fast-track rendezvous. 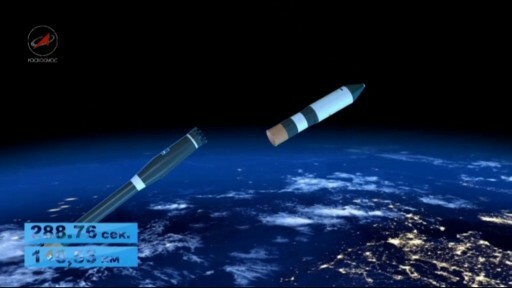 The third stage shut down eight minutes and 46 seconds into the flight, making use of a modified shutdown sequence implemented since the Progress M-27M failure to reduce the shock at engine cutoff. 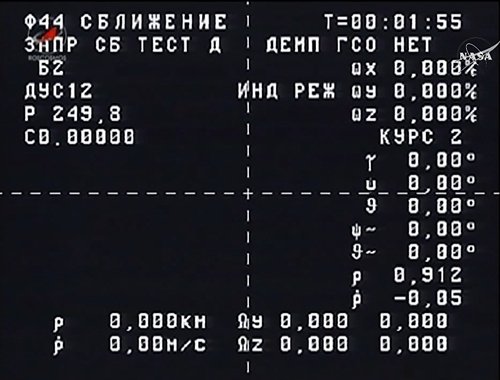 Two seconds after shutdown, Progress was sent on its way, making a clean separation as indicated by good telemetry being received from Progress in the minutes after separation. Immediately after spacecraft separation, Progress executed the typical steps of deploying its two power-generating solar arrays and the two ASF KURS Antennas on its forward end. The pressurization of the Unified Propulsion System primed the thrusters for use to dampen any residual body rates to set up for proper power generation and orbital maneuvers later on. Tracking data was collected while Progress was still over ground stations and onboard orbit determination is to be tested as part of the MS systems verification. With a clean bill of health, Progress headed out over the Pacific Ocean on its first lap around the Planet, beginning its link-up with ISS. Sticking to the 34-orbit rendezvous, Progress MS-02 will be tasked with a pair of engine burns on its third orbit followed by a burn on Friday to properly position the spacecraft for the initiation of the Automated Rendezvous on Saturday. 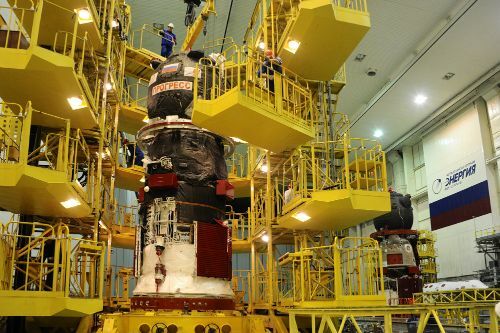 Progress will complete a series of tests over the course of Thursday and Friday to put the new systems through their paces and gather confidence in the upgrade that is to fly on the Soyuz for the first time in June. 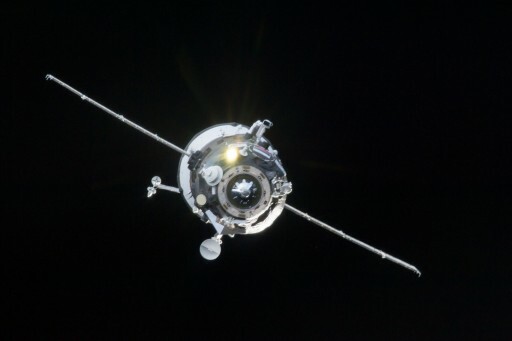 Progress MS is set for an automated docking to the aft port of the Zvezda Module at 18:00 UTC on Saturday to mark the start of a six-and-a-half-month stay.